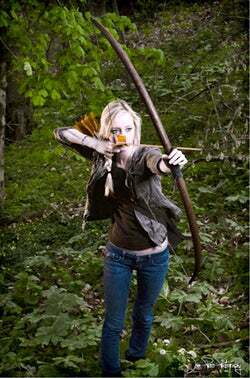 Any time a bow and arrow play a prominent role in a Hollywood hit (think Braveheart, Lord of the Rings or Avatar) the 29-year-old Lancaster Archery Supply in Lancaster, Pa., gets a bump in business. But this time, in the four weeks since the The Hunger Games hit the big screen, the 55-employee distributor and manufacturer of target archery equipment has seen sales increase in a "profound way," says President Robert Kaufold, who chalks it up to tweens and teens interested in emulating the sharp-shooting heroine Katniss Everdeen. Indeed, the story has proven a fertile ground for entrepreneurs. Penned by Suzanne Collins, the plot involves a life-or-death game show in the post-apocalyptic future, where "tributes" from one of a dozen "districts" are pitted against the elements and each other. Despite the dark elements, it's game-on for all things Hunger Games-related. Official merchandise -- everything from iPad covers and pajama bottoms -- has quickly hit the shelves. "It's a licensing dream," says Lacy J. Lodes, licensing director for Consor, a La Jolla, Calif. consulting firm that specializes in intellectual assets. Lionsgate, the studio behind the film, could potentially "make more money on the licensing than the movie itself," she says. In February, Lionsgate and print-on-demand company Caf?Press teamed up to create an official online store hawking apparel, accessories and novelty goods tied to the movie. Many of the items on the site were designed by independent merchants, who make money when their items sell. Aficionados can support Katniss' dueling love interests with "Team Peeta" and "Team Gale" T-shirts and stickers, or show their allegiance for individual districts with journals and tote bags. Nail polish makers China Glaze, a division of midsize Los Angeles beauty company American International Industries, launched its "Colors from the Capitol" line of colors three weeks before the movie premiere. So far the response from consumers has been "amazing," says company spokesperson Tori Matt. Not just anyone can slap The Hunger Games name on a product and go into business, says Lodes. Merchants must get a licensor's blessing, agree to share a percentage of sales and guarantee a minimum royalty payment with a deposit that can range from $5,000 to $100,000, depending on the product and terms of the agreement. That hasn't stopped artisans from putting Katniss' trademark Mockingjay design on handmade jewelry, infinity scarves, custom sneakers, stationary, you name it. A recent search for The Hunger Games on online marketplace Etsy turned up 7,700 items. Smaller merchants often skirt the issue of licensing by selling unofficial merchandise "inspired" by the movie, says Lodes, and studios may be willing to turn a blind eye if the products support the brand and "aren't complete knock-offs." Mattel's Katniss Everdeen Barbie doll notwithstanding, The Hunger Games hasn't attracted the kinds of big-ticket promotional tie-ins that typically accompany other blockbusters. Blame it on the macabre storyline of kids killing kids. But experts say the flick -- part of a trilogy -- still has the potential to be as big a brand as the likes of Harry Potter or Twilight, and small companies have been piggybacking on the movie's success. "It appeals to a broad audience," says Agata Kaczanowska, who is a lead market analyst at Los Angeles research firm IBISWorld and herself a fan. "You have the Capitol style, which is very high fashion, and then you have Katniss's style, which is more about the outdoors." Hunger Games Fan Tours, a three-day $389 tour around North Carolina's DuPont State Forest, where many scenes in the movie were filmed, gives participants a little taste of both. Guest tributes are assigned districts by lottery, feast on elaborate Capitol-esque dinners (costumes encouraged), learn survival skills and compete for points based on their aptitude for building fires and hitting targets. Tours are nearly sold out for weekends in June and July and attracting clients of all ages. "Our first booking was family of three generations of women from Kansas," says Tammy Hopkins, co-creator of the tour. Lancaster Archery Supply is finalizing designs of a "District" bow. Since the movie hit big screens, Everything Archery in Memphis, Tenn., has seen a "severe" increase in demand, particularly from women. They aren't just looking, says owner Ty Davis, they're buying. "We have already called up the last half of our annual order of recurve bows because of the young people interested," he says, of the bows that resemble the kind used in the movie. Lancaster Archery Supply, meanwhile, is finalizing designs of a "District" and "Capitol" bows and is trying to license with Lionsgate. The bows, expected to retail for $79 to $99, are designed for target archery - not hunting or defending against the Catos of the world. The trickle-down effects of a blockbuster often have a limited shelf life, says Lodes, but the odds are "ever" in favor that the The Hunger Games franchise will endure until the November 2013 release of its sequel, Catching Fire. Oliver Burruss contributed to this article.